Running Guy Lapel Pin - 100 Count by Jim Clift Design at Helix Alumni. MPN: CC328-100. Hurry! Limited time offer. Offer valid only while supplies last. Hurried executives who find themselves running around all day can maintain a sense of humor with our 'running guy' pin. Perfect for the human race. 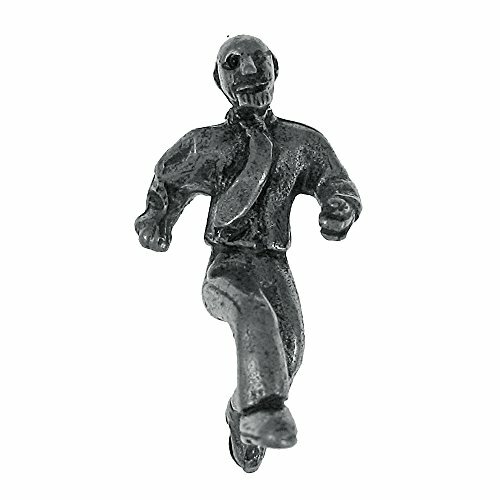 Hurried executives who find themselves running around all day can maintain a sense of humor with our 'running guy' pin. Perfect for the human race. Handcast in solid, lead-free pewter, each of our pins is an original three dimensional sculpture signed by the artist, Jim Clift. Individually packaged on one of our signature presentation cards, our pins arrive ready for gift giving! Handcrafted in our studio in Coventry, RI, our pins are 100% US made. If you have any questions about this product by Jim Clift Design, contact us by completing and submitting the form below. If you are looking for a specif part number, please include it with your message.